2.3ts and NA 2.3s had c3s behind them, their horsepower and torque curves were severely different between eachother and the 200. Wondering if anyone knows if there is a higher stall between those three and if I could bolt it behind the 200t. See my "run of the mill" 200 build thread in "Forced inductions"! Thanks in advance! PS: I cross posted in foureyed Pride since those guys probably have more 2.3t knowledge. Again, TIA! Check at once with with OpelGT+3point3. I stopped posting when I found I messed up the teeth count when going my 1985 Ford Sierra A4LD to Aussie 3.3 swap. Too much is different to help out. A lot of teeth info varies between the 132 teeth US 3.3 flexplates, and the European EAO/Lima 135 and 2.8 Cologne 138 teeth V6's. There are seven types of converter listed, but only three stall speeds. I've gotten them wrong because all my C3's and A4LD's have been the 2.0 EAO, 2.3 Cologne V6, and 2.8 US Cologne V6, and 4.0 5R55 Cologne V6. I never checked my C3 1981 Mustangs tooth count, I just used the stock V6 converter and bellhousing, and used my other Australian 160 teeth 3.3 block with a pilot adapter. US 3.3 stuff is smaller. Ratio and stall speed vary, and C3's a real pest because all the European data rate the Bordeux C3 at 2.2 or 1.9, but the US C3 figure is 1650 rpm, like the Aussie in line sixes and V8'S. Cologne V6 (2.3/2.6/2. tighter 1.9:1; Id guess the 2.3 1980-1981 Turbos, XR4TI's, all the same. Seven listed. FM139 is high stall 2.3, you'll have to reweld or manipulate the C3 9.1 " spacing to 9.25, by checking the Lima 135 teeth C3 flexplate against the 3.3 132 teeth flexplate. Get a EAO 2.0/ 2.3 Lima converter. So normally, according to Crosley at FSP, the elements from each converter are brought together to create others. I';m pretty sure ther are only three converter types for the last 1987 Merkur XR4TI back to the first Pinto C3 gearbox of 1973. The in line 3.3 liter C3 is very, very tight, a nominal 1650 rpm. I got 2.30 from one source, which might be 2.14:1 or so. All low compression, standard duty i6 and V8's have there spinner angles bent to create that level of stall, despite the diameter differences. Haynes says the foreign Cortina/Taunus V6 2300 has a 1.9:1 stall ratio. Probably 1900 rpm rated with Fords 2.0 and 2.3 V6 engines. I4's should be the same. Haynes says the foreign Cortina 2 liter EAO has a 2.2:1 is the stall ratio for some foreign 2.0 Cortinas, pretty loose, maybee 2200 rpm or more. Xstacy, always a wealth of information. So basically, an NA 2.3 (lima) converter should get me a few RPM of stall, enough to take some lag out. Better than the 1650 factory. (I figured it was something low like that). Autozone here lists a few for under $100 with a core. A few of the bolt diameters for the 2.3 and 3.3 are listed the same under the part specifications, but you know parts stores, often the specs aren't indicative of the true design. I will probably have to pull the trans and measure the bolt diameter before I order. Also I will have to get a centering bushing. .75 to1.375 doesn't sound terriblyall hard to find. Ask your favorite converter maker if they'd make something custom for you. It might surprise you..
See all my cars here: Pikesan's Garage What's in your garage? A couple of my buddies suggested that too. I manly try one local biz. I'm in hawaii on oahu, where the only racetrack has been closed for several years, so performance shops are starving or dead. Pikesan, yeah, Hughes performance will do whatever, since they do intimate rebuilds. Splendid reputation. Derangedfords90 wrote: A couple of my buddies suggested that too. I manly try one local biz. I'm in hawaii on oahu, where the only racetrack has been closed for several years, so performance shops are starving or dead. OpelGT+3point3 has probably forgotten more than we've learned on C3's, and still aces the class. FM139. My 2.3 Cortina had that number, its a nice, loose V6 converter. The best option is finding a junked core 2.3 Pinto, Fox or Courier/ Ranger auto (any 2.3 on your island will be auto mostly), and sending its T/C. As a junkyard or scrap proposition, finding one with that code is highly likely. They say 1980 on wards, but the C3 2.8 was certainly 1974 to 1979, then witdrawn. Mustang II's were mostly C3 auto 2.8's. Pinto's last year, 1980, auto 2.8. I mean, I'm not Charles Kingsford Smith or any thing, but I have a 2.0 Pinto torque converter here, common as dirt. What you get back, will have to be welded up and re-pittched to the new pitch center, or each of the flexplate holes elongated 75 or perhaps 62.5 thou. The C3 is not a C4 or A4xx/5Rxx, but it can do a very good job with off the shelf bits. I'm not gonna have the "don't bother, just get a c4 junk....Ford used the C3 from 1.3 liter Kent Escorts, on up to the 3.0 British and South African Essex 60 degree V6. Although the C4 was the step up auto option for 2 years on the British engined Capri GXL 3000's and Granadas, the C3 replaced it, and has a good factor of safety as long as you don't shove it in park at 55 mph. 157 SAE Hp or 138 DIN hp (103 kW) at 5000 rpm and 192 SAE lb/ft or 174 DIN lb/ft of torque at 3000 rpm. Turbo versions of any kind of V6, Cologne or UK Essex 60, could easily go to 230 DIN hp and 273 lb/ft DIN torque, and an auto will cope with that in a 2800 pound Capri, Euro Sierra, or XR4Ti. Fords 2.8 Turbo rating of 188 hp DIN net was 197 rwhp. Those kind of ratings were past the normal limits of the 206 lb-ft rating Rocket Type 4 gearboxes, and T9's. Ford reworked the heck out of that box over 15 years, the A4LD was a concurrent 1985-1990 trans with the C3 still an option on low tier Euro Fords, which also got debugged before the excellence that was the 1996 versions. Others can talk smack about the reliablity in Rangers, Exploders etc, but they are really heavy under powered vehicles, with a bunch of very different soliniod wring protocols, and good technicians even got caught out with the very silly "replace trans fluid Technical Service Bulletin . Ford made some sad TSB errors with that import box, and rebuilders made some cost cutting short cuts with respect to replacing front pumps. Everything was a 1000 dollar fix at trade rates back then, and a lot of service work wasn't done right. TAB/TAD solinoids as shift controllers, the TPS, the clutch lock-up, the different wiring and control each year...d did a H-U-G-Eamount of Bordeuax trans development. I appreciate the kind words, but my experience with C3 converters is limited. Lots with A4LD converters. But it sounds to me like the 2.0 Pinto converter would have the highest factory stall based on what xctasy posted. My opinion of C3's isn't the general consensus. A C3 clutch is larger than a C4. The C3 drum is so large that while you can put a C4 band on a C3 drum, you can't even use a C3 band on a C4 because the ends will contact and it won't tighten. The C3 can be upgraded with 4.0 5R55E parts. Some C3 drums have only three fibers while the HD A4LD and later computer controlled trans have six. I shake my head when I see A4LD's replaced with stock C4's. There are a lot of aftermarket parts available for the C4, but stock 5R55E upgrades for the C3 and A4LD blow them away unless you want to spend over a grand just on race parts. There's a six plate kit for the C4 direct drum for $120 on ebay; stock in a 5R55E. Back in 1980 when I first started doing automatics, the C4 was considered to be the bottom of the barrel. It had more problems than all the other transmissions I was doing put together. Course the C3 was cursed as well, but it was designed for lighter applications; kinda like the GM 200thm. But both of these trans were state of the art three speed autos; and they still are. Plus they can both be upgraded with the overdrive HD parts that succeeded them. Mine shifts very well behind the stock 200 on 7 psi. I am sure I am well below the threshold for maximum power, but your opinion of the C3 is definitely very different than the general consensus. Mainly I am considering slamming a converter in it since I will eventually be removing the trans to change the rear seal, as positive crankcase pressure has coated the underside of the car with a very good layer of oil. I picked up a Transgo shift "improver" kit for the C3 thinking I was going to kill it on the first drive, but was very satisfied (still am) with the performance of the trans in its stock form. I don't intend to modify much because I doubt I will make over 200 FWHP but would like to preserve it as much as possible. Also, I'd like a bit of RPM flash to build boost early as it takes a bit.... thanks to the low stall speed and 2.7x's gears. Figured if I could find another TC and pop it in inexpensively it wouldn't hurt. The c3 and 3.3 match is just perfect. The US 256 cam is perfect. The 1-bbl 3.3 and C3 are a match made in heaven. Everything else was just hot air and lack of respect to Fords TSB's. All parts imported into the USA get panned by press, (unless its a 1972-1978 Foird Capri V6..). 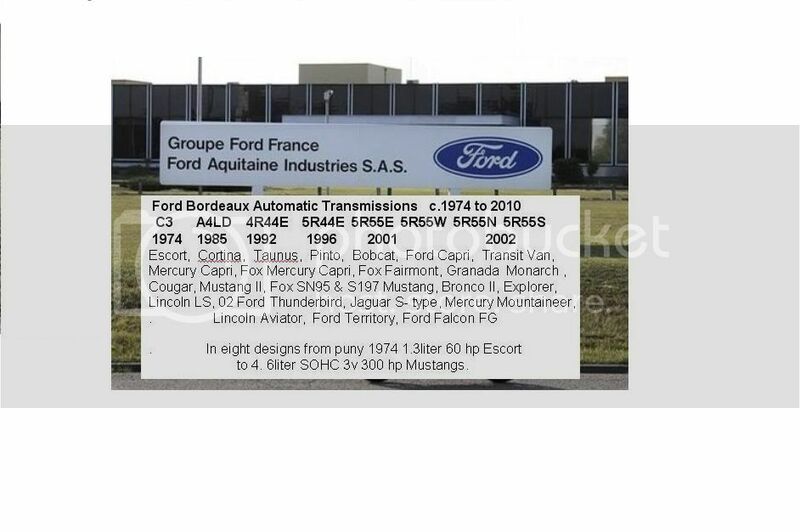 Why Ford would sink 37 years into a turky that never changed from 1974-1989, and could cope with a 60 hp 1.3 or a 145 hp Turbo Tbird, Merkur or Mustang...end of story.. .it wasn't a turky, people just SAID it was. And Ford US decided to keep the Bordeux transmission plant. The only real caveat I've found in working with the C3/A4LD is realignment of the pump halves. The separator plate is easy to align visually, but I had to make a special sleeve to align the back cover with the pump bushing. I used a piece of PW Eagle 1-1/4" Schedule 40 rigid pvc conduit by slicing it longitudinally to remove about quarter inch of the circumference and adding about ten half depth slices to make it easy to compress and insert thru the bushing. I think the difficulty in aligning the pump halves gave rise to the concept that a new pump bushing had to be machined on center. So don't take your pump apart if it was factory assembled unless there is pressure loss or the bushing is worn. You can see it when you remove the front seal, plus the converter might be scored; indicating the bushing is worn. But the thing is, if the converter is scored, it's probably because the pump halves were misaligned in a rebuild. This could cause vibration and cracking the flex plate. Another way that would work is to bolt the converter to the flexplate, insert the input shaft, bolt on the bellhousing, install the pump, visually center the separator plate aligning the bell to case holes, and measure the edges where the large o-ring goes and feel for where the centering of the pump cover is. Tighten the pump bolts then remove the entire bell/pump from the motor and bolt it to the trans. Preferably with the motor on the floor front face down. I always measure from the outer pump edges to the outer separator plate edges (after I'm sure the plate is centered) to double check my work. I have a 15mm socket I just run around the perimeter.